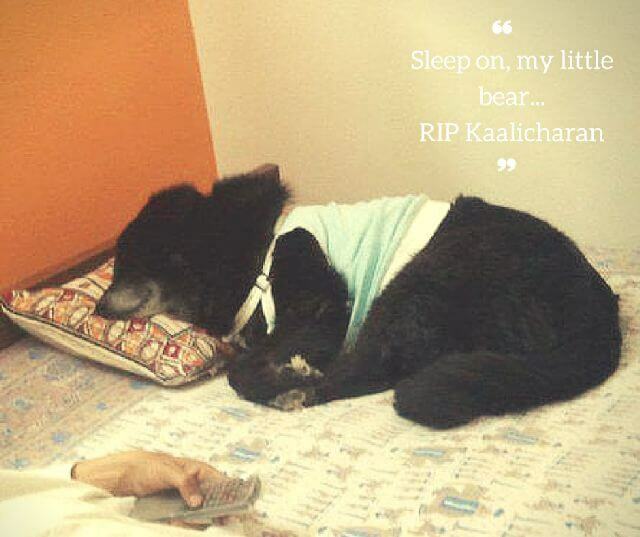 On the eve of Ruskin Bond’s birthday, Kaalicharan died. 14 winters young, she exhaled for the very last time, late last night. She didn’t push the daisies or kicked the bucket but died. No euphemism can conjure, conceal or cure this pain. Far off in the bleakness of a summer night in Delhi, I heard her last cries – the muffled barks, so unlike her. And the clock hasn’t been normal since. The cruel hours wouldn’t just pass. It is all quiet in the cold cellars of my heart. And once every few seconds, pain plays a cacophony I can’t bear. When you lose your dog…the outside world moves on as if nothing happened. With a calm indifference, the pines and the berries, and the gurgling Gola river were all the same as Kaalicharan was laid to rest near Rusty’s shrine. The twin rose buds from Rusty’s resting place caressing the wind to greet her little sister. The cruel hands of May, took in turns, both my furry friends. And everyone keeps reminding me of the long happy life Kaali led. They say that I of all people, the Dog with Blog guy should know how to handle this grief. But I know no better. It feels as if my life force, the elixir has left me. Like mercury in May, this pain in my throat, shoots up to the center of my head and wouldn’t just die. 14 years, truly is a remarkable life span for a huge mountain dog like Kaali. But why it can’t be 30, wasn’t there a dog who lived that long? What you lose when you lose your dog to death? Is it just your composure or an entire childhood melting away like ice cream scoop in mid day sun? I don’t have pictures from Kaali’s pup days when my father rescued her from a garage. Her proud dark face with a snow-white French cut looking at everything around cautiously. How I hid her in my denim jacket as we came downhill. How she looked at the sun, unflinchingly. How she saw me through my heartbreak, unlike those who promised they’d stay but never did. Unlike the world and worldly common sense, a dog’s happiness isn’t defined by square feet. Not measured in spoons or bowls but even a tennis ball is happiness. So often, she would come running and throw herself at the freshly mowed grass and if you happened to be sprawled on the lawn reading Bond or Bukowski, you’d feel her bear weight on your limbs or back. Ain’t no massage like that! Over the seasons, her eyes turned from the honey shade to a cloudy vacuum and I could no longer see myself in them. No, she wasn’t blind but the signs were telling. Age and all the ailments it brings. Yet, she remained a hermit. When you lose your dog, the one who has seen you mature (or not) from your childhood fancies, you lose the scale that pits you to reality and relevance. You lose the glue that bound everything for you. And now I see her coal black fur everywhere, as if looking for me- winter coats, books shelves, TV rack…may be if I could just collect enough of it, Kaalicharan would come to life. Kaali, I wish there was a secret frequency I could call you at and you’d come. But no matter how many times I give voice to your names— Kaalu, Kaali, Kaalicharan, please?… I know you’d never return. Your paws would not come dancing to where your lad stands now. Alone. In dead silence. People from all over the world called a friend in Kaalicharan, be it Virve in Sweden, Virginia in Greece or Cathie in Canada, the Himalayan scent called them all. She always loved me, even when I didn’t deserve it. And she loved me more than I’ve ever managed to love myself. I wish I could have been a better boy to the wonderful friend that she was. Pulled poles apart in this grist mill called life, I saw her way less than I should have. With choked tears as I think about her at this moment, I can smell her coffee bean breaths, her glistening black fur, like that of a stallion. My own private dire-wolf. Why do we always learn a little too late? Love at the end of all things should be like this. Like how a dog loves you. You may be lost to the world’s design, little goals, planning that blue-print for life while there standing patiently, the dog waits for nothing or no one but you. I’m sorry Kaali, for all the vacations, I didn’t come home. For those lost chances where I could have slept beside you, putting your giant paw on me, the weight that always made me light at heart. As another stray gust of wind brings her fur, coiled like cotton candy, I know no vacuum cleaner can ever wipe her memory. Ever. My goodness, I am saddened by this news, Abhishek. As you recount what’s lost and what goes on, I visualize exactly how the valleys look like, with the unbearable silence. 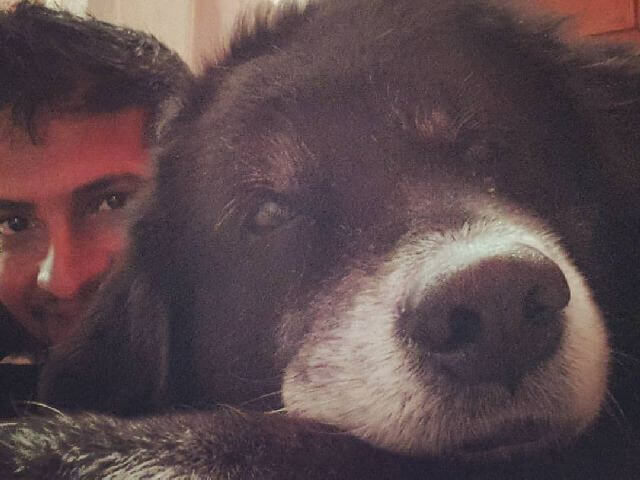 I am so very sorry for this loss… and yes, dogs never die. But here’s what i should tell you, something so common that we share as individuals who have been blessed to have been loved by those dear and kindred souls; our lives have been better, happier and purposeful because of them. We have learnt compassion and kindness in their light. We have known what it means to be unconditional, in whatever small measure that we have been, and the world that we have been in, and will continue to inhabit, has been a better place because of them! And yes, bears do not die, they only change form! Takecare. He’ll will be always there in our hearts. Dogs really teaches us what real love is. I know. . I can feel it…The pain…its cutting. dog… I exactly know what this pain is… I am unable to control my emotions alongwith the tears. 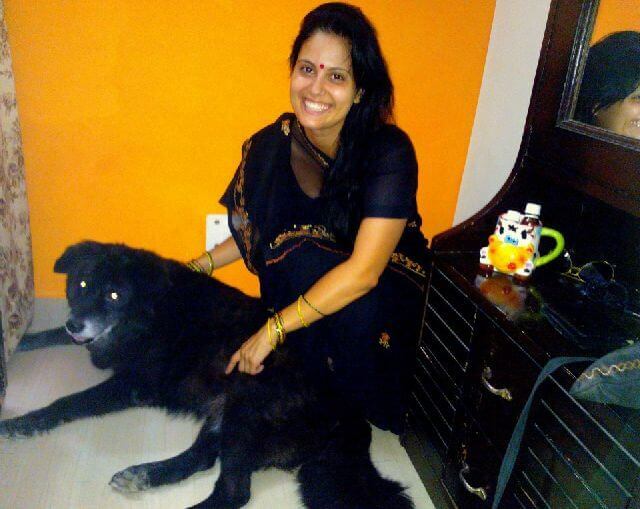 I lost my darling 3 years back… maybe in physical presence, but he lives on in my heart till I myself die. He was a 15 year old Pom cross breed and the love of my life. We grew up together and now it feels as I have lost a part of me. I am just posting a small write-up … you may relate to it. I sure did. “For those of us, who have loved them and lost them. And then picked up the courage to love again, this will make sense. And it will soothe. ”Some of you, particularly those who think they have recently lost a dog to “death”, don’t really understand this. I’ve had no desire to explain, but won’t be around forever and must. Nope, dogs always want to go for a walk. They might get one step before their aging tendons collapse them into a heap on the floor, but that’s what dogs are. They walk. It’s not that they dislike your company. On the contrary, a walk with you is all there is. Their boss, and the cacaphonic symphony of odor that the world is. Cat poop, another dog’s mark, a rotting chicken bone ( exultation), and you. That’s what makes their world perfect, and in a perfect world death has no place. However, dogs get very very sleepy. That’s the thing, you see. They don’t teach you that at the fancy university where they explain about quarks, gluons, and Keynesian economics. They know so much they forget that dogs never die. It’s a shame, really. Dogs have so much to offer and people just talk a lot. Next Next post: 10 awesome ways to exercise with your dog!